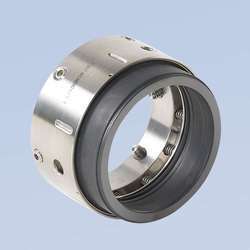 We are leading manufacturer and supplier of different types of Mechanical Seals. The offered products are widely acknowledged for their fine finish, accurate dimensions, durability, anti-corrosion and capacity to bear high temperature. 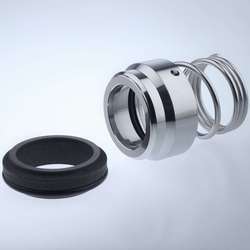 These seals are highly durable and corrosion resistant as well. Due to the compact design, our Mechanical Seals eliminate the requirement of extra radial and axial space in their installation. Furthermore, we also offer customized range of this products in order to fulfill specific demands of our clients. Available Range: Cartridge Seal, General purpose Rubber Bellow Seal, Single Coil spring Elastomer Bellow Seal, Conical Spring Unbalanced Seal, Multi Spring Unbalanced Seal, Multi Spring Balanced Seal, Multi Spring Reversed Balanced Seal, Single Coil Spring Unbalanced Seal, Welded ends Metal Bellow Seal, PTFE Bellow Seal, Single Coil Spring Balanced Seal, Stationery mounted Single Coil Spring Seal, Top Entry agitator Double Seal, Dry Running Agitator Seal. 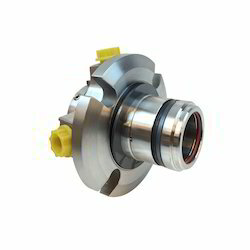 We bring forth a qualitative array of Mechanical Seals that is used in various industries. Rubber Bellow Mechanical seal are most commonly used rubber bellow seal, Due to its compact design it can be easily mounted. It has a unique rubber bellow secondary seal, which provides a high degree of axial flexibility to compensate for lack of concentric of the shaft misalignment wear due to thrust movement of the shaft. The seal can be use regardless of direction of rotation since the driving torque is not transmitted through the coil spring, The required driving torque is enhanced through the unique rubber bellow which fits on the shaft. There are no bonded Joints and all the face materials are interchangeable without having to modify any dimensions. Generally used in sewage applications, waste water pumps fuel injection pumps. single and double form, and the gland plate is often fitted with various tappings to provide for flushing, cooling water injection, and disaster control. The cartridge can overcome several limitations of the standard pump gland. Tangential tappings for introducing fluids into the gland cause less disturbance to the seal face than the radial tappings often found on pump units. Look again at the tapping provided for flush water to the packed gland, a tangential tapping would provide a less turbulent water source. For a packing gland this may not be important but to a mechanical seal it can be another adverse condition with which to cope. The setting position of the seal is set by the cartridge design, but the seal unit should not be screwed to the shaft until the gland plate is secured to the pump and any adjustments made to the shaft position. Once this has been completed the set screws can be tightened and the spacers removed. and provide high operation reliability. Shaft fretting is minimized due to lower spring loads provided through wedge or '0' Rings, occupies less stuffing box area due to its narrow cross-section compact design. These Seals can be easily assemble or dismantled through circlip provided cab be change to Balance version of its type merely by changing the carbon face only an be provided with single, double or tandem arrangement worth external seal support systems devices. Generally used in Petrochemicals, Light Hydrocarbons General Industrial Fluids. Used in high pressure pumps, refineries, fertilizers, nuclear plants petroleum products. Used in acids, alkalis extremely corrosive services. 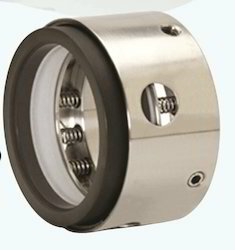 This Mechanical seal series are special purpose single coil spring balanced seals designed for use in media containing abrasive or solid particles. • Spring completely protected from the product. • Easily handle media containing abrasive particles and solids. • Axial compensation of movement 1mm. • Perfect for standardization purpose. Generally used in high temperature applications of various chemical, petroleum, refinery and polymer industry. The seal contains the secondary seal, the ‘o’ ring. The face materials and elastomers can be varied as per requirement of the application. The conical helical springs transmits the torque. The seals depend on the direction of the rotation. The conical helical spring can be fitted easily by pushing on the shaft and twisting as the spring winding. So, the spring diameter enlarges easily to make easy fitting. One can judge the direction of the rotation from the drive end of the shaft. The clockwise rotating shaft requires the right handed spring and anti-clockwise rotating shaft requires left handed spring. 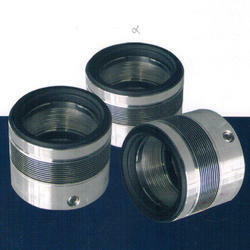 The conical single spring unbalance seals are used in central heating system in circulation pumps. It’s also used in the chemical process pumps, sewage and submersible pumps and chemical process pumps. Which Are Suitable For Fluid. SS 316, SS 304, Hast - C, Monel, Alloy -20. These Seals are pushers type balanced multi spring seals generally used where high-pressure sealing is required. Due to its compact radial axial dimensions these seals required lower stuffing box space for installation. 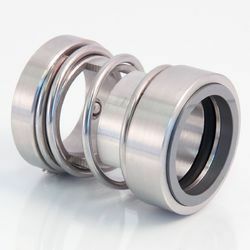 These seals can be provided with single, double or tandem arrangement with external seal support systems devices. Generally used in Petrochemicals, Petroleum refinery, Light Hydrocarbons General Industrial fluids. This Seal is Inherently balanced metal bellow seal. This seals are independent of direction of rotation. 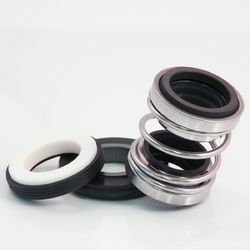 The unique feature of this type of seal is that, there is no dynamic '0' rings and therefore it will never hangup or damage the shaft and sleeve, it also has an ability to handle corrosive as well as abrasive viscous media. These seals have self-cleaning non-clogging construction. With selection of special bellow material it can be used in highly corrosive media. Generally used in for handling highly corrosive chemicals, high Temperature applications, petroleum refinery etc. Color White, Black, Grey etc. This Seal is specially designed for extremely corrosive chemicals, including concentrated acids, salts, strong oxidizing reducing agents and chemically active organic compounds. All components which come in contact with the liquid being scald are made of chemically inert material. Metallic components clamping ring and springs are located outside the media. 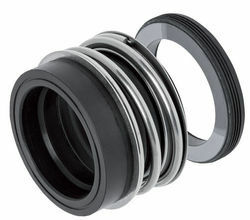 In this seal series Glass filled PTFE face is composite moulded with highly flexible PTFE bellows. • Shaft diameter 01 : 1.0"...2.875"
Silicone rubber since its discovery has been used for a wide range of applications. One such sector in which it has been extensively used is Pharmaceuticals. Because of its chemical inertness, Food grade properties and its transparency, It became one of the favorite choices in the selection of polymeric raw materials. We provide the Silicone Inflatable Seals to the clients. Some of the main unit processes in the production cycle of any pharmaceutical industry include granulation, blending, Drying, coating etc. In the process of Drying these companies use machines called as Fluidized Bed Dryers (Also known as Fluidized Bed Equipment acronym: FBE) or more commonly known as FBDs. Coating processes make use of the Machines called Coaters. All of these machines are made of various grades of stainless steel. From time to time these machines have chambers, which have to be cleaned to start another batch, change filter bag or sometimes just for maintenance shut down. Hence these machines are never in one piece but generally have openings. The thing about these openings is that even when they are in operation they create contamination by bringing in the outside atmospheric air. One thing common about all of these machines is that they need to be 100% contamination free. That implies, no atmospheric substance including air can come in contact with the product being processed. Hence a new Innovative polymer product was manufactured to give 100 percent sealing between contacting metal parts in the FBD machines. These were called Silicone inflatable seals. These were called so because of their unique properties that made them different than regular seals. These seals can inflate and seal all nooks and corners perfectly so as to give 100 percent sealing even when the machine is pressurized. Platinum Cured Transparent silicone inflatable seals are used on fluid bed dryer as well as fluid bed processors FBP in machines of capacities from 25 kg to 1500 kg. Looking for Mechanical Seals ?